Many people have very low opinions of their own artistic ability, if they even concede any to begin with. The province of art is often viewed as a realm reserved for the gifted few creative types whom the heavens have blessed with artistic ability for unfathomable reasons. Basic realistic drawing is actually a skill that anyone can learn, and acquire enough proficiency in to receive great satisfaction from the effort. The Sight Size Method is a method of constructing realistic drawings that has been used to draw and teach drawing for centuries. It is the training wheels of drawing. 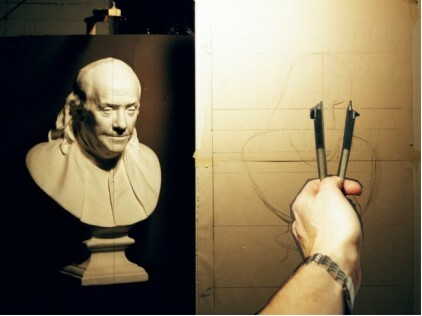 It is a method by which anyone with any amount of drawing experience can set up and execute a realistic figure drawing. The basic principle on which this method depends is “tangency”. A tangent occurs when an object in the distance is perceived to be “smaller” rather than “further”. The typical example of this is the experience most people have had of seeing somebody’s vacation snapshots where and individual, smirking at his own wit, is posing with an outstretched arm so it appears he is touching the top of a mountain. The mountain is actually off in the distance. One can experience this first-hand by stretching out one’s arm, extending the thumb and index finger, looking at the space between those fingers, and seeing what one can “hold” between them. A third example is this: Imagine standing inside a house, looking through a window at a person outside. Standing in front of the window, you would be able to make a mark (or place some tape) on the window, where you see the top of the person’s head. You would also be able to mark where you see the person’s feet. On the window, the distance between your two marks (probably a 8-12 inches) would be considerably less than the actual height of the person (probably five to six feet). If the person standing outside moved further away from the window, they would appear smaller, and if they moved closer, they would appear larger. 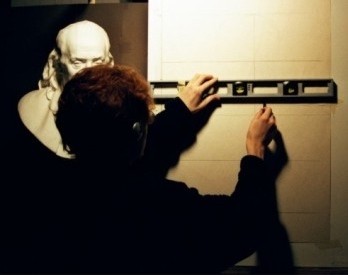 The crux of the sight size method is lining up the drawing and the model so they visually appear to be the same size. 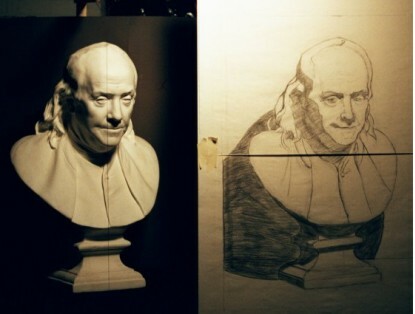 Once they are seen as being the same size, it becomes possible to mechanically measure and judge the accuracy of a drawing’s proportions, shapes, and spatial relationships, and thereby create a realistically drafted drawing. The tools needed are a ruler, a plumb line, a knitting needle, easel, drawing paper, and whatever drawing medium is desired. A plumb line is merely a string or piece of thread, at least the length of the arm of the person using it. Anything long, straight, and thin can be substituted for the knitting needle. The drawing medium can be anything: pencil, pen, pastel, or even paints. The first step is to get the set up your position. For the sake of this example, what is being drawn is a plaster cast. 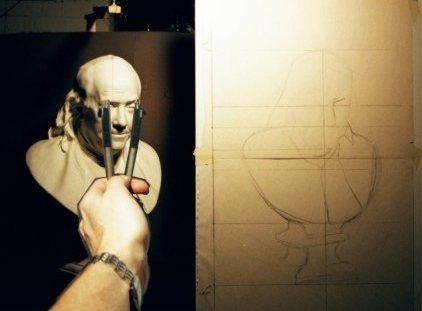 The drawing paper needs to be mounted on the easel with the midpoint of the paper at the viewer’s eye level. The easel should be positioned in front of the cast. Take several large steps back. This is your “vantage point”. 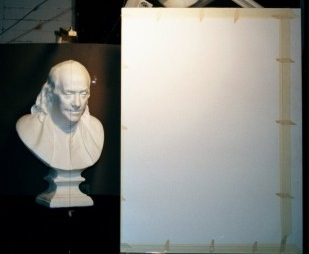 It is from here that you will be able to look at the cast and your drawing, and have both appear to be the same size. Your vantage point should be about 3 times the height of your cast. Once the vantage point has be established, it should be marked on the floor, usually with masking tape, so that you can easily find exactly where to stand again. Once all of this is established, you are ready to begin drawing. To start the drawing, the first thing to do is to establish the boundaries in which the drawing will fit. Standing at the vantage point, you should take the plumb line, hold each end in each hand, and fully extend both arms. Keeping the line horizontal, raise or lower the plumb line until it touches the very top of the cast head. The middle of the plumb line should be between the cast and your paper. 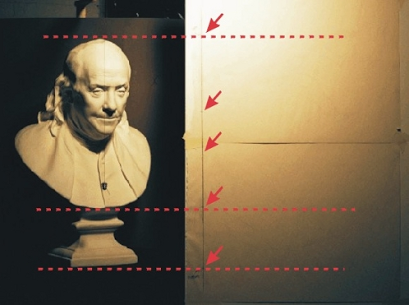 Make a mental note of where the plumb line intersects the edge of the paper closest to the cast. Then, go and mark this point on the paper. Now, whenever you step forward, to mark on the paper, away from the vantage point, the visual appearance of the cast will change, i.e. as you move forward, the cast will appears to grow in size. Do your best to remember where, from the vantage point, where the mark was supposed to be, and place the mark there. Once back in the vantage point, raise the plumb line horizontally to the top of the cast with the center of the plumb line between drawing and model, and gauge whether or not your mark was too high or two low. If it was too high or two low, erase and re-do the mark in a more accurate spot. This should be repeated for the bottom point of the cast, and for at least four other major forms in the cast. The result will be a series of marks on the left-most edge of the paper, which prepare you for the next step. When five or six of these marks are in place, take your ruler, place it horizontally on the paper, and extend a line across the paper from each mark. Next, mentally pick a central point on the model. If the pose is a frontal pose, the navel is usually good for this. Next, use the ruler to draw a vertical line down the center of the paper. Where that vertical line intersects with the horizontal line you extended from the mark lined up with the navel, will be your central point of the drawing. You now have a series of horizontal lines and a vertical line. These lines are the scaffolding for your drawing. From here forward you will be able to relate They are reference points Since they are now marked on the paper, it is easy for the student to judge where to lay down the initial shapes of the figure. 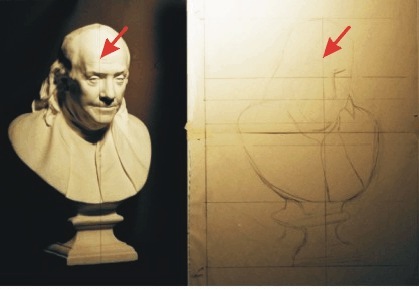 The student should then proceed to lay down, freehand, the basic outlines and shapes of the figure. Invariably, these initial basic statements will have shape and proportion problems. You can then begin the process of drawing and checking. To make a specific comparison, a pair of calipers is used. To check a distance within the cast, for example, first return to the vantage point. Extend out your arm, holding the calipers parallel to the model. Place the tip of the calipers at one end of the form, and the other tip at the end of the other form you wish to check. With your arm extended, move the calipers over to your drawing and judge if length of the form you drew matches the distance marked off with the calipers. This process can be repeated as many times as necessary. It can be used to judge all kinds of lengths, widths, and spatial relationships. It can be used to not only judge positive space relationships, (positive space meaning space where something is) but negative space relationships, such as the space between the knees, or the space between the elbow and torso, or the chin and the chest, etc. By repeatedly checking and correcting the corresponding spatial relationships in your drawing, your drawing will become a more and more accurate representation of what you see. This process has been described in terms of cast drawing. It can be used for any kind of art where representation is a goal, for almost any subject matter. 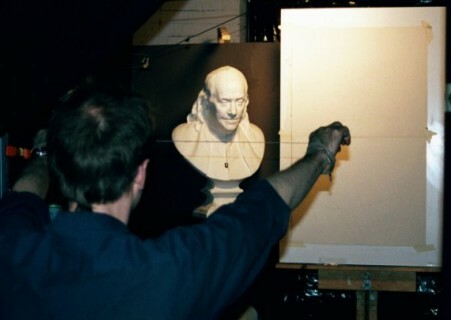 It can also be used with any medium, drawing, paints, and even in sculpting. Just as with training wheels and learning to ride a bicycle, with practice the training wheels are needed less and less. 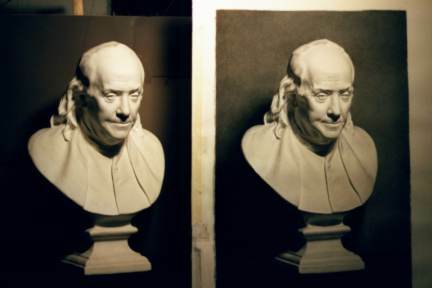 As with this method, as it is practiced, one develops an “eye” for drawing accurately what one sees and the method is needed less and less. And once the method is needed less and less, the road is open for whatever creative direction you wish to travel.